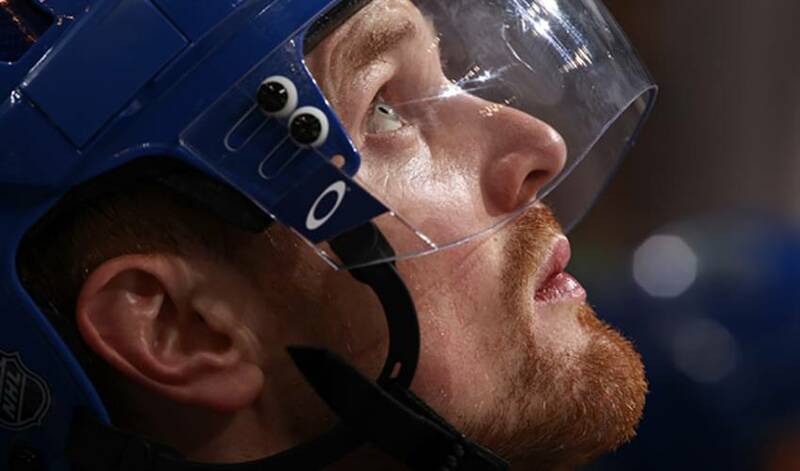 When his brother Daniel was injured earlier this season, it was the first time in Henrik Sedin's career that he did not have his brother on his wing for an extended period of time. In a situation like that, with the Sedin twin having such such incredible symmetry together on the ice, it would not have come as a surprise if Henrik's offensive output dipped a bit. This certainly was not the case. Henrik continued to lead the Canucks through the stretch without their #1 line intact and have maintained the pace in the tight Northwest Division. Now, with his brother back, Henrik sits tied with Joe Thronton atop the NHL's points lead and the question now becomes; “How high can he go? ?” In Vancouver's 17 games since the start of December, Henrik has scored in all but one of them, posting multi-point games in 11. He currently rides a seven-game scoring streak, with 14 points in a span where the Canucks won six games and lost only once, in overtime to the Coyotes. With seven points this past week, with at least two points per game, it's a given as to who is the hottest player currently in the NHL. Tied with San Jose but with a game in hand, the Blackhawks are atop the Western Conference and the NHL's overall standings following another ten-game stretch where they played .800 hockey. After crushing the Devils 5-1 on New Year's Eve, the Hawks followed that up with three more wins against St. Louis, Anaheim and Minnesota. The Blackhawks looked very determined in these victories, controlling the play and dictating the style of game in each. The Blackhawks are sending six players to Vancouver for the Olympics in February, and cases could easily be made for several more on the club to have received invitations. The Hawks is incredibly deep with talented young players who will likely taken a lot away from their loss to the Red Wings in the Western Conference Finals last year. If Detroit was the cream of the crop last year in the West, the Blackhawks know there is a strong possibility that they may have to go through them again this year at some point. A little over halfway through the season, Chicago has put themselves in excellent position for whatever happens between now and June. Facing a former team is usually a good antidote for a slumping player, and for evidence to help support that theory, look no further then Sean Avery's game against Dallas on January 6th. After being held pointless in his previous five games, Sean exploded for a goal and three assists against the Stars, as well as being whistled for a tidy 12 minutes in penalties along the way. In that one game, the left-winger from Pickering, Ontario eclipsed the point total he had amassed for all of December. Avery was a factor in all facets of the game, getting the Rangers on the board in the 1st, grabbing a beautiful assist on a Chris Drury goal in the 3rd period and he got under the Stars' skin all night long. One can only imagine how much more he could have done had he not spent half of the second period in the penalty box with a misconduct. Having captained a Memorial Cup winning team and scored the tournament winner for Canada in the World Juniors, Philly defenseman Danny Syvret is used to performing in key times. Playing at Boston's hallowed Fenway Park in this year's edition of the Winter Classic, Danny scored a goal that will go down in history as the first in the 98-year history of the ballpark. The goal was special for another reason though, as it was Danny's first career NHL goal, something every hockey player dreams of as a child. The marker almost held as the game-winner until Mark Recchi tied the game with just over two minutes to play. Having grown up just outside Hamilton, Ontario, Danny scored his second career goal against the Toronto Maple Leafs on January 6th, an accomplishment that no doubt meant a great deal to the 24-year old. Now in his 8th NHL season, Eric Belanger of the Minnesota Wild has been a strong and steady player over the course of his career for four different NHL clubs. Eric recently suited up in his 600th NHL game, an accomplishment that does not go unnoticed here at NHLPA.com. Punctuating the night of the achievement, Eric scored two goals in a 4-1 victory over the Flames. The native of Sherbrooke, Quebec is on pace for his best season statistically and is a calming influence for a young Wild team. Congratulations, Eric from the NHLPA, on this significant accomplishment. - Boston goaltender Tim Thomas talks about his New Year's Day experience this year, having won the Winter Classic against the Flyers and being announced as one of the goaltenders for the 2010 United States Olympic to the sellout crowd at Fenway Park following the conclusion of the game.